We followed a pair of lionesses for over 3 hours knowing their preference for daylight hunting. Thinking and hoping they were about to strike on a single drinking Giraffe, however with lions being big curious cats, the pair got distracted by a family of Banded Mongoose that panicked attempting to scramble to safety with mongoose scattering here there and everywhere, she struck out at a separated mongoose striking a flattening blow, but somehow the fearless foe wrangled free managing a miraculous escape! It was such a thrill to witness this rare and exciting David versus Goliath moment, that had a fortunate ending for all the family! This encounter happened in the blink of an eye and having the new lightweight 500PF in hand at the time made all the difference in capturing this sequence. That's not to say I could not have captured this with my 400/2.8 prime but the ease and handheld ability of the 500PF really came into it's own here. A wonderful capture of two very different fearless creatures. You can see the life dynamics in the image. Very cool action shot! You obviously must have been quick to capture it. The low angle adds to the intimacy. An amazing image and very interesting story, Marc. Incredible photo, Marc- terrific action, and what a story!! The new 500 4.6 is pretty cool-glad you caught this unique scene-must have been good light at ISO 360. 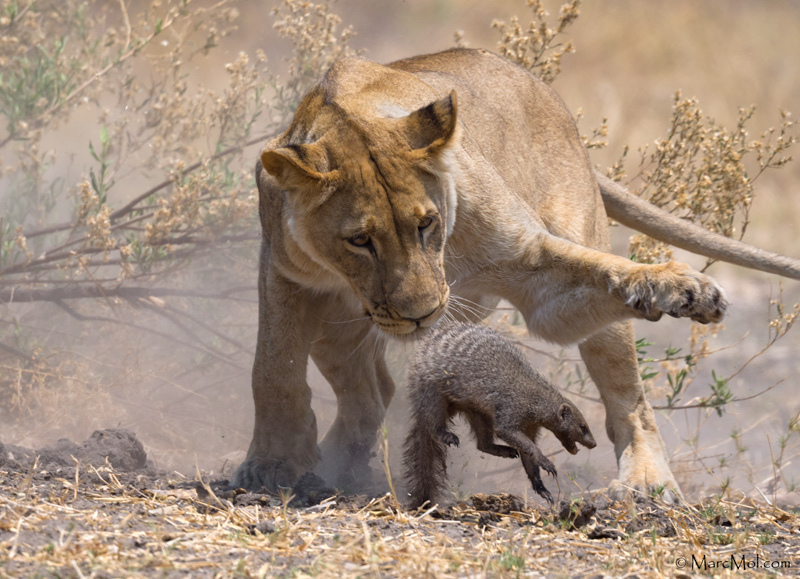 Glad it had a happy ending, at least for the mongoose. Wow.. Fabulous sighting Marc. Thanks for the info. That 500 looks like a must have.. Nice one! Brilliant capture of the intense interaction between these two, Marc! Not only did you get this incredible shot but from the optimum angle too, giving us a wonderful view of their faces - both lion and mongoose, and from a perfect eye level! Superb image. Great capture. Love the story. An amazing image and moment! Many thanks for the positive comments everyone, and also NS for the Editor's Pick. being at the wright place and moment is always a bonus in itself, great stuff on the capturing nature at work and yourself as-well. Congrats Marc, an awesome and unique image, something I had not seen before.